In researching flooring there is almost too much information to review. Nearly every flooring supplier has some green/eco claims (sometimes believable) for their product. 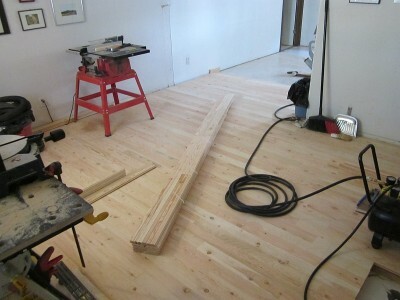 We decided on a Douglas Fir plank floor because it's a local product, it should be long wearing and we like the look. The wood is harvested near Pecos, then milled in Las Vegas, NM before being trucked to our home in Santa Fe. That's about 120 miles from tree to installed floor! Of course, wood also sequesters carbon, specifically 212.9 kg/m^3 (13.29 lb/ft^3) for Southern Rocky Mountains Softwood. While this wasn't a quick DIY project it wasn't very difficult - with two people and the right tools! Thanks to my good friends I was able to borrow an air compressor, floor nailer, finish nail gun, table saw and a power miter saw which were indispensable. Even more valuable was my friend David, who spent most of a holiday weekend nailing down flooring with me. Once the wood was installed it was comparatively relaxing to waltz across the floors with a rented orbital floor sander. I then finished the floor with low-ish VOC stain and lower VOC water-based polyurethane. I'm still working on the baseboards and other finishing touches, but the floors do look great. Douglas Fir isn't a hardwood and it will dent if you drop something on it (like I already have) nor is it as quick to install as prefinished planks, but I think it was worth the effort. The wood is also harvested so that it reduces the chances of high-intensity fires in fire-prone forests. I'm sure there are easier ways to sequester carbon, but this method also gives you something beautiful to stand on.